Climate change is the defining issue of our age. The rise in the average temperature of the Earth’s climate system and its related effects is no longer a prediction. Multiple lines of scientific evidence show that our climate system is warming. Climate change is happening right now, and at a faster rate than initially predicted. People are experiencing the significant impacts of climate change, which include changing weather patterns, rising sea level, and more extreme weather events such as storms, floods and droughts. Climate change is disrupting national economies, affecting lives, costing people, communities and countries dearly. The landmark Paris Agreement reached at COP21 in December 2015 commits all countries to holding global temperature rise to “well below 2 degrees Celsius”, which will require economy-wide global and national transformations. Rather than being seen as our biggest problem, tackling climate change through climate action is best understood as our biggest opportunity. Transitioning to clean energy will not only reduce our economic risk from climate change, it will also increase the resilience of our infrastructure, protect public health and create job opportunities across regions and sectors of the economy. In construction alone, 800,000 new jobs are expected by 2050. Clean energy is big business! 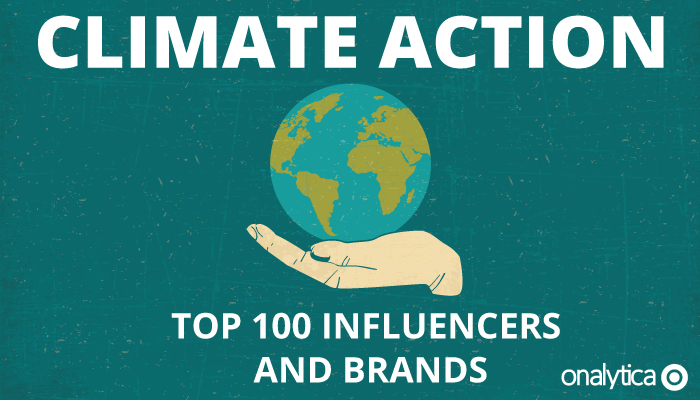 We were very interested in seeing which influencers and brands were leading the discussion around climate action. In order to identify the influencers we first needed to look at the conversation, and as Twitter remains the best platform for identifying influencers due to its open data policies, we started by extracting over 84K tweets tweets from 2nd September – 1st December 2016 mentioning the key words: “ClimateAction OR Climate Action”. We then added these tweets and accounts into our database, categorised and curated a list of the top 100 influencers and brands ranked on a combination of the 4 R’s (Resonance, Relevance, Reach and Reference) and added into our Influencer Relationship Management software (IRM). 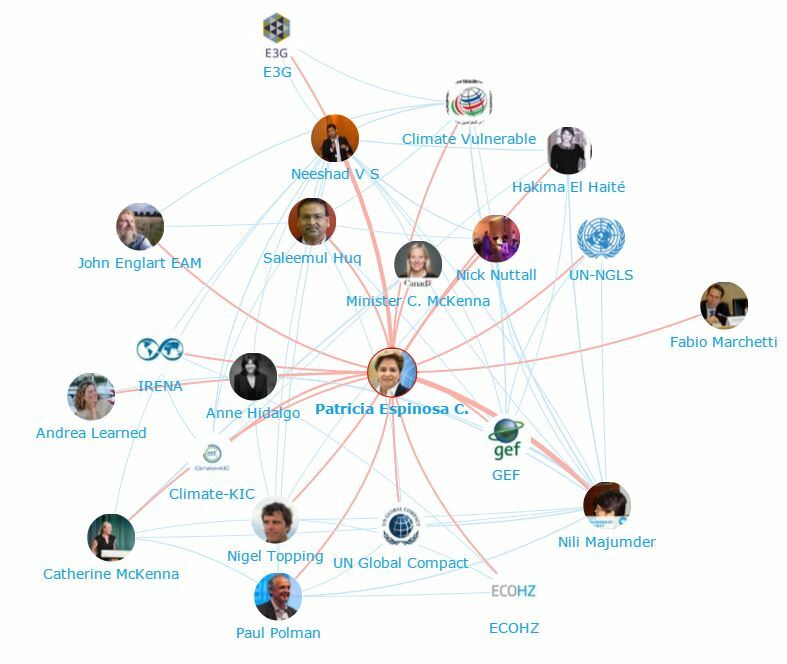 Below you can see a network map of the conversations with the number one influencer Patricia Espinosa C. at the centre. Be sure to click on the map to enjoy the full size network diagram in greater detail. Below you can see another network map created with in IRM showing the number 1 brand UN Climate Action at the centre. If you are interested in learning more about identifying, managing and engaging with influencers click here for a free trial! 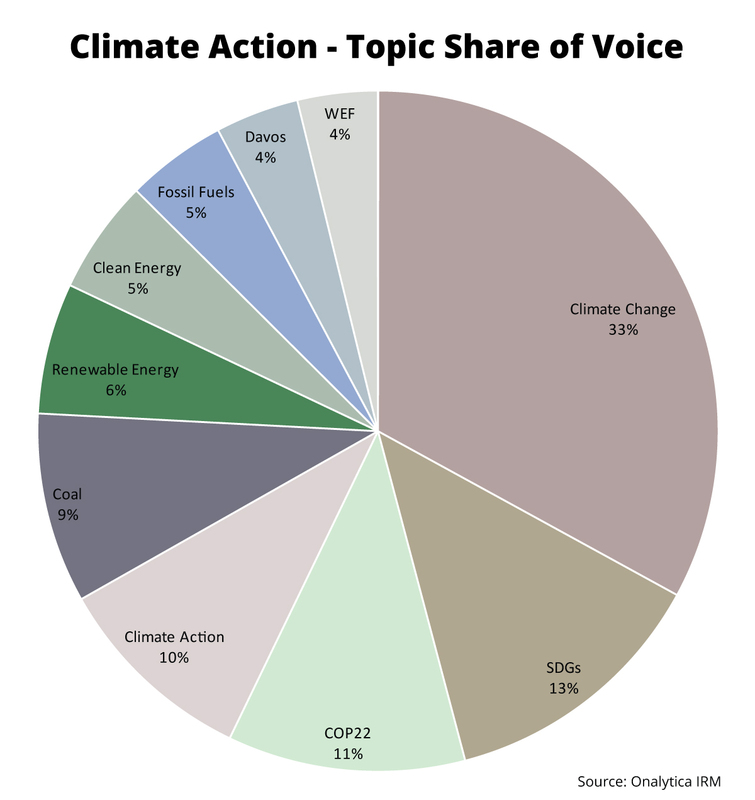 The most popular topic mentioned in tweets and blogs by the top climate action influencers unsurprisingly is Climate Change with a 33% share of voice. Sustainable Development Goals or SDGs was the 2nd most popular topic among the influencers, receiving 13% of all mentions. The 3rd most popular topic was Cop22 with an 11% share of voice. Climate Action itselft received a 10% share of voice, showing there’s an opportunity for influencers to engage in more discussion around #ClimateAction. Coal received an 9% share of all mentions, illustrating how important it is to shift away from burning coal to create energy. Renewable Energy, Clean Energy and Fossil Fuels all received a similar share of voice (5-6%), followed finally by mentions of Davos and the World Economic Forum (WEF) which both received a 4% share of mentions among the top 100 climate action influencers and brands. 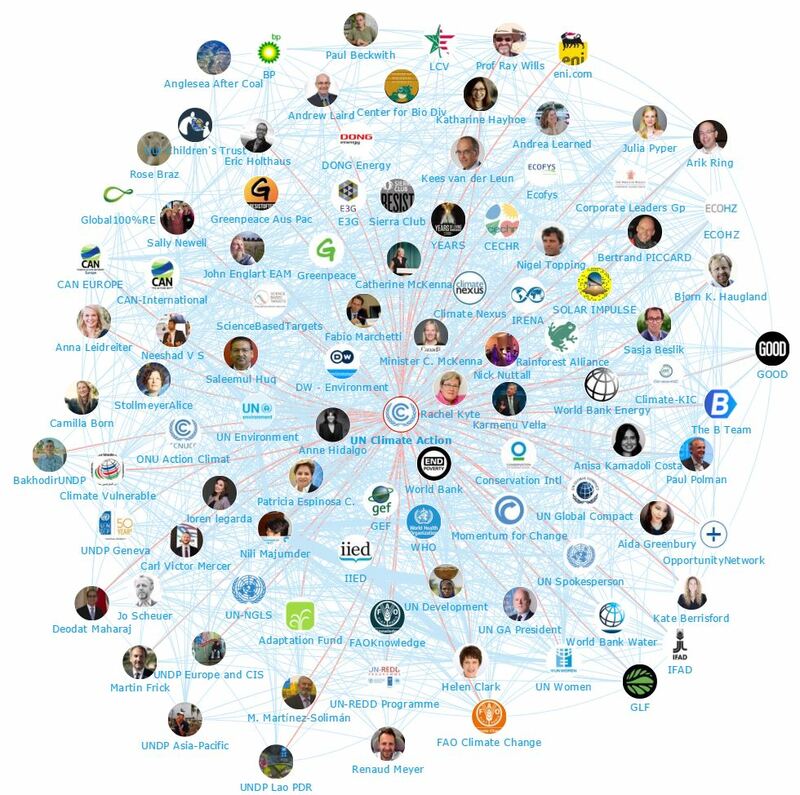 Below is a list of the top 50 influencers talking about Climate Action on Twitter. If you want to see who ranks from 50-100 be sure to download the full report by clicking the download button below! Here is a list of the top 50 brands talking about Climate Action on Twitter. If you want to see who ranks from 50-100 be sure to download the report to get the full top 100 list! For more insights into the Climate discussion why not check out the blog we co-created with Andrea Learned titled Cities4Climate and C40Cities: The Power of Influencer Engagement. 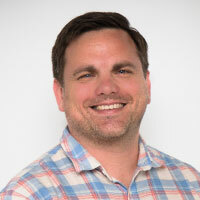 There’s also a great podcast discussion with Andrea and Stephanie Stuckey Benfield (CRO for Atlanta) here. Look out for the next blog in this 3 part series on #Women4Climate coming soon! Disclaimer: As ever with these lists, it must be stressed that the ranking is by no means a definitive measurement of influence, as there is no such thing. The brands and individuals listed are undoubtedly influential when it comes to driving discussion around climate change.